The aggregate market value of the voting and non-voting common equity held by non-affiliates of the registrant was approximately $100,729,827 as of June 30, 2009, based upon the closing sale price of the common stock as quoted by the NASDAQ Global Market reported for such date. Shares of common stock held by each executive officer and each director and by each person who is known by the registrant to own 5% or more of the outstanding common stock have been excluded from this calculation as such persons may be deemed affiliates. This determination of affiliate status is not necessarily a conclusive determination for other purposes. As of February 26, 2010, the registrant had 26,577,977 shares of common stock outstanding. Parts of the Proxy Statement for the registrant’s 2010 Annual Meeting of Stockholders, to be filed with the Securities and Exchange Commission pursuant to Regulation 14A not later than 120 days after the end of the fiscal year covered by this Form 10-K, are incorporated by reference in Part III of this Form 10-K.
Web.com Group, Inc. (“we,” “us,” “our” or the “Company”) is a provider of Do-It-For-Me and Do-It-Yourself website building tools, online marketing, lead generation, eCommerce, and technology solutions that enable small and medium-sized businesses to build and maintain an effective online presence. The Company offers a full range of Web services, including online marketing and advertising, local search, search engine marketing, search engine optimization, e-mail, lead generation, home contractor specific leads, website design and publishing, logo and brand development and eCommerce solutions meeting the needs of a business anywhere along its lifecycle. Our primary service offerings, eWorks! XL and SmartClicks, are comprehensive performance-based packages that include website design and publishing, online marketing and advertising, search engine optimization, search engine submission, lead generation, hosting and email solutions, and easy-to-understand Web analytics. As an application service provider, or ASP, we offer our customers a full range of Web services and products on an affordable subscription basis. In addition to our primary service offerings, we provide a variety of premium services to customers who desire more advanced capabilities, such as eCommerce solutions and other sophisticated online marketing services and online lead generation. The breadth and flexibility of our offerings allow us to address the Web services needs of a wide variety of customers, ranging from those just establishing their websites to those that want to enhance their existing online presence with more sophisticated marketing and lead generation services. Additionally, as the Internet continues to evolve, we plan to refine and expand our service offerings to keep our customers at the forefront. Through the combination of our proprietary website publishing and management software, automated workflow processes, and specialized workforce development and management techniques, we believe we achieve production efficiencies that enable us to offer sophisticated Web services at affordable rates. Our technology automates many aspects of creating, maintaining, enhancing, and marketing semi-custom websites on behalf of our customers. With approximately 275,000 subscribers to our eWorks! XL, SmartClicks, and subscription-based services as of December 31, 2009, we are one of the industry’s largest providers of affordable Web services and products that enable small and medium-sized businesses to have an effective online presence. We traditionally have sold our Web services and products to customers identified primarily through strategic marketing relationships with established brand name companies that have large numbers of small and medium-sized business customers. We have a direct sales force that utilizes leads generated by our strategic marketing relationships and leads acquired directly to acquire new customers at our sales centers in Spokane, Washington; Jacksonville, Florida; Manassas, Virginia; Shavertown, Pennsylvania; Barrie, Ontario; and Scottsdale, Arizona. Our sales force specializes in selling to small and medium-sized businesses across a wide variety of industries throughout the United States. We also acquire a large number of customers directly through online and affiliate marketing activities that target small and medium-sized businesses that want to establish or enhance their online presence. Providing Comprehensive Solutions for Small and Medium-Sized Businesses. Our goal is to enable small and medium-sized businesses to outsource their Web services needs to us. Our experience is that many small and medium-sized businesses do not have the in-house expertise to effectively design an online presence that will generate adequate traffic to their websites and increase direct consumer interaction. As a result, our customers look to us to provide these services. Our Web services include, among other features, a full range of Web services, including website design and publishing, online marketing and advertising, search engine optimization, lead generation, home contractor specific leads, logo and brand development and eCommerce solutions. We believe this combination provides our customers with a comprehensive solution to their Web services needs. Offering Affordable Subscription-Based Solutions. Because our customer base is value-driven, we provide our Web services on an affordable subscription basis. eWorks! XL and SmartClicks customers typically pay a recurring monthly fee ranging from approximately $70 to over $100, depending on which services and products they purchase. Premium Search Engine Marketing service targeted at businesses with significant spending on local print yellow page advertising. This service is priced at an average of approximately $300 per month, which we believe is significantly less than the typical cost of traditional campaigns such as half-page or full-page print yellow page advertisements. Do-It-Yourself Site Builder targets businesses to design, publish and manage a professional website on a recurring monthly fee ranging from approximately $12 to $90 per month. 1ShoppingCart.com eCommerce and online marketing solutions typically on a recurring monthly fee ranging from approximately $29 to $99 per month. Lead Generation memberships, specifically targeted to contractors in the home services business market, ranging in price from $50 to $150, based on the specific trade vertical and geographic area. Search Engine Optimizing solution packages, ranging in price from $500 to $5,000 per month. Streamlining Operations for Customer Acquisition, Fulfillment, and Support. We utilize proprietary workflow processes and customer relationship management systems, together with a combination of integrated template-driven and specialized website design tools, to sell, design, and support our Web services and products. We believe this integrated infrastructure has enabled us to significantly reduce the time from initial customer contact to site completion. Our goal is to design a website and have it complete and visible on the Internet within 72 hours from the time we receive initial information from the customer. Additionally, we have extensive experience promoting, selling, and supporting our web services and products to small and medium-sized businesses. Forming and Enhancing Strategic Marketing Relationships. We focus on forming strategic marketing relationships with companies that have large customer bases of small and medium-sized businesses. These companies generate leads for us by providing lists of their customers, conducting e-mail marketing campaigns about our Web services and products, advertising our Web services and products on the Internet, and using other forms of both direct and indirect solicitation. These companies filter the customer lists they provide to us using a number of criteria that we believe indicate when a small or medium-sized business is likely to understand the value of our Web services and products. We also develop relationships with leading technology providers, including major software, hardware, development and online marketing organizations, to enhance the design and sales of our products and services. Relationships with these companies allow us to quickly gain access to innovative technologies and provide more creative solutions to our customers. Our Premium Search Engine Marketing,1ShoppingCart.com eCommerce, Lead Generation, Search Engine Optimization and Logo Design services provide additional sales channels for our core Web services products. Premium Search Engine Marketing and 1ShoppingCart.com eCommerce utilizes a network of affiliate and private-label resellers that are prospects for our other services and that can be leveraged to offer our services to their customers. Our Lead Generation network of home services contractors is also a source of prospective customers for website and online promotional services. Logo Design customers are also prospects for online marketing and web design services. Up-selling or cross-selling additional services to existing customers. Customers acquired through traditional and online marketing programs that target hosting or Do-It-Yourself website design services provide significant opportunities for up-selling and cross-selling additional online marketing, lead generation and search optimization products. Additionally, some of these customers are also prospects for our Do-It-For-Me services. Continuing to Target the Small and Medium-Sized Business Market Segment. We believe the small and medium-sized business market offers us the best opportunity to continue building a leading national Web services company. We believe this is an attractive market because it is large and because these businesses need a comprehensive, affordable solution to their Web services requirements. Our Web services meet critical business needs of these businesses that they often do not have the time, resources, or technical skills to fulfill themselves. Developing or Acquiring Complementary Services and Technologies. We sell Web services and products that are essential to an effective online presence such as local and regional lead generation, search engine optimization, website search tools, affiliate marketing networks, and Web analytics. While we currently provide many of these services through our relationships and agreements with other vendors, we will seek opportunities either to internally develop some or all of these services and products or acquire businesses that provide them. Additionally, we may seek to acquire companies with existing customer bases in our target market into which we can cross-sell our Web services and products. Expanding our Distribution Channels. To sell our Web services and products cost efficiently, we capitalize on the connection those organizations, with which we have strategic marketing relationships, have with their small and medium-sized business customers. We plan both to expand the scope of our current strategic marketing relationships, as well as to develop additional strategic marketing relationships with organizations that have strong brand recognition with small and medium-sized businesses. We also expect to increase our marketing and sales activities so that a larger proportion of our customers are acquired through increased direct sales and new reseller programs. 1ShoppingCart.com eCommerce and Lead Generation also provide additional opportunities to expand and diversify our distribution channels. Selling Additional Services and Products to Existing Customers. As of December 31, 2009, we had approximately 275,000 subscribers to our eWorks! XL, SmartClicks, and other subscription-based services. As customers build their online presence, we believe that we can demonstrate the value of the additional premium services and products we offer, which can increase our average revenue per customer and improve our revenue growth. For example, we can provide paid search and eCommerce capabilities to our current customers’ websites, enabling additional sources of revenue for them while also contributing to a measurable return on their investment. Strengthening Customer Retention. We are dedicated to enhancing customer retention and building lasting relationships with our customers. We believe it is critical to customer retention to target small and medium-sized businesses that already understand the value of the Internet to their success. Improving customer retention also requires maximizing customer loyalty. Therefore, we are focused on customer satisfaction, consistent communication, Web service and product enhancements, and high quality customer service. Additionally, we believe that by educating our existing and prospective customers about the value of our services to their businesses, we can build lasting customer relationships. Extending Our Position as an Affordable ASP. Through the combination of our operational scale and geographical locations, we believe that we have been able to minimize the cost of delivering our Web services and products. Our template-driven processes enable us to handle orders efficiently. We have strategically located our primary sales and fulfillment facilities in the lower-cost areas of Jacksonville, Florida and Spokane, Washington, which helps us to better manage our cost of operations even as we expand. In the future, we may look to new international labor markets to further reduce the cost of providing our Web services and products. Using our proprietary software and workflow enabled processes, we develop and support subscription Web service packages that include a 5, 10, 20, or 40 page semi-custom website and related services. These comprehensive packages include the tools and functionality necessary for a business to create, maintain, enhance, and market a successful and effective online presence. We build, test, and publish the websites and provide related services for our customers. We also provide tutorials and tools for customers to edit and manage their sites. Alternatively, customers can select from one of several levels of support programs for ongoing management and maintenance of their websites. Our primary subscription offering is eWorks! XL, a comprehensive website design and publishing package targeted at getting small and medium-sized businesses online quickly, effectively, and affordably when they have no online presence, or a limited one. The package includes a five-page semi-custom website built on our proprietary self-editing tool, which allows for easy maintenance by the customer. By using our comprehensive, performance-based package of services, customers eliminate the need to buy, install, or maintain hardware or software to manage their online presence. This offering includes a broad set of configuration and customization options using a Web browser. We build the initial website for the customer using the content and design information the customer provides. Our goal is to have a customer’s website visible on the Internet within 72 hours from the time we receive initial information from the customer. Initial Site Design. One of our design specialists begins the process by interviewing the customer and collecting data about the customer’s business. We then create a unique website tailored to the customer’s specific needs using one of our templates. Every site we build goes through an extensive quality review and assurance process prior to being published on the Internet. Additionally, every site undergoes a thorough website optimization process to enhance search engine placement. Online Marketing. We offer our customers online marketing capabilities that cost-effectively promote their websites on a local and national basis. The package includes initial submission and ongoing submissions on a regular basis of the customers’ websites to many popular national and local search engines. Additionally, eWorks! XL includes listings in online yellow page directories, search engine optimization tools, and educational guides targeted to small businesses. Performance Scorecard. Customers receive a detailed report of their website traffic, including visitors generated through the online marketing and advertising services provided in their eWorks! XL package. Unique 800 Telephone Number. Customers receive a unique 800 number that is forwarded to their business telephone line. Information about the calls received through the 800 number are tracked and reported on the Performance Scorecard. E-mail Marketing. We provide an e-mail marketing tool that enables our customers to easily communicate with their customers and prospects. To assist our customers in collecting e-mail addresses, every website includes a subscription sign-up box for site visitors to provide their e-mail information. Webmail. Every customer receives unlimited e-mail boxes tied to its domain name. Webmail is compatible with Microsoft Outlook and features advanced filtering and search capabilities and automatic mail forwarding and responding. Online Web Tools. eWorks! XL includes advanced online tools such as a forms manager, polling and survey capabilities, a guest book, and site search features that offer interactive website management capabilities. Modifications and Redesign Service. Customers can choose between several different levels of support, which range from having us make ongoing changes to using the self-edit tools we provide. The basic service included with eWorks! XL includes 60 minutes per month of free modification and phone consultation with one of our Web designers. Domain Name Registration. We obtain, purchase, and register a domain name appropriate for the business selected by the customer. Hosting and Technical Support. Our hosting platform offers technology and security designed to ensure the reliable daily operation of a customer’s website. Our secure Web hosting includes disk storage, daily backups, and a monthly data transfer allotment. We also offer technical support, including services to our customers to provide the information and consultation they need to build and manage an effective online presence. Mobile Website. eWorks! XL includes a version of the customer’s website built specifically for mobile devices. SmartClicks is a performance-based service with a higher subscription fee than our eWorks! XL offering. Our SmartClicks offering is targeted to customers that want additional online advertising in their local service areas. SmartClicks includes all of the benefits provided in the eWorks! XL bundle and the added benefit of guaranteed pay-per-click advertising in Google and other major search engines. An added value of the SmartClicks package is the advertising management function the Company performs for these customers. We create the pay-per-click ads, buy appropriate keywords, monitor the program’s performance and report results to customers as part of the customer’s subscription. eCommerce Solutions. We offer a comprehensive set of services that enable businesses to sell their services and products online. Our service offering includes creating the online store catalog and secure shopping cart, establishing an online merchant account and assisting in setting up online payment and order processing. Power Marketing Bundles. Our Power Marketing package is an array of services and products we sell to customers that want increased local or national exposure on the Internet. Options include additional online yellow page listings and search engine submission tools. Visibility Online. We bundle a number of different services contained in our eWorks! XL package into our Visibility Online offering, which is designed to enhance the effectiveness of an online marketing program for our non-eWorks! XL customers. These services include initial search engine optimization, search engine inclusion, Yahoo! Site Match paid inclusion, listing in online yellow page directories and site submission to many popular search engines and search submission tools. Internet Yellow Pages. We work with customers to design an advertising program using several Internet yellow page directories. This provides our customers the ability to target specific buyers for their own services and products locally, regionally, or nationally. Search Engine Optimization. We provide search engine optimization tools and consultation to customers that want greater visibility and performance from their online presence. Our search engine optimization products and services are designed to help improve search engine rankings and to increase qualified traffic and lead generation. Custom Design Extras. We offer several custom design features and services, including map and directions pages, external links pages, the ability to increase the number of products listed on a customer’s website, more advanced website statistics, database applications, password security, expanded e-mail services, and premium hosting services. We offer a variety of Do-It-Yourself website building and marketing solutions for small and medium-sized businesses that are more technically savvy and intend to build their own websites or enhance their websites with online marketing. These solutions include hosting services, an easy-to-use web building tool, eCommerce capabilities and online marketing. Potential customers are identified through traditional and online marketing as well as through a number of distribution partners, resellers and affiliates. We offer core products that are standardized, scalable managed hosting services that place numerous customers on a single shared server – a cost benefit that is passed along to the customer. Starter packages are designed for websites with relatively low volumes of traffic and allow our customers to establish an online presence at minimal cost. Our hosting services feature easy-to-use control panels and extensive online documentation that allow customers to control their own applications. These hosting services are sold stand-alone or bundled with a suite of website tools and services. We offer complete custom website design services that provide sophisticated functionality and interactivity beyond those available under eWorks! XL and SmartClicks. These sites are typically built for larger, more established customers that have had an online presence in the past, or that are designing their first website with unique specifications. Customers work directly with our experienced Web designers to build a fully customized website. Additionally, we are able to sell any of our subscription-based Web services and products to our custom Web design customers. Our team of custom design professionals includes experienced Web designers, programmers, copywriters, and search engine optimization experts who work together to ensure that the customer’s online business objectives are met. Custom sites are built with sophisticated design tools that provide the flexibility and functionality to meet advanced business needs. Custom sites can include flash, animation, eCommerce solutions, sophisticated interactivity and database functionality. Through 1ShoppingCart.com and Solid Cactus, we offer a robust set of sales and marketing tools for businesses selling products and services online. 1ShoppingCart.com and Solid Cactus offer an ASP, subscription-based shopping cart solution with add-on modules that allow small and medium-sized businesses to create, promote and manage their online presence. Services include a comprehensive affiliate management program, e-mail marketing, auto-responders and ad trackers. We offer targeted lead generation services for various business categories. We provide a competitive marketplace that matches homeowners in need of remodeling services with qualified contractors (such as plumbers, landscapers, roofers and painters) in their local area. Through a subscription-based membership model and per lead acquisitions, contractors purchase these leads, giving them the opportunity to bid on the homeowner’s project. We offer search engine marketing services that provide fully customizable solutions based on our customers’ goals and business plans. Some of these services include search engine optimization, link building, pay-per-click advertising management, public relations and press release distributions. We are a leading provider of do-it-yourself logos and other premium design products to small businesses around the world through our LogoYes products. Our LogoYes do-it-yourself logo creation tools provide professional, affordable design products that equip small businesses to compete with large ones. LogoYes products and services help build a company’s brand value by presenting a strong, unified image. We also provide the LogoYes design and brand building tools to our Do-It-For-Me web services customers. We provide a comprehensive set of products and services that enable eCommerce merchants to sell more on the Internet. By coordinating and integrating eCommerce website design and development, Internet marketing, customer service and back-end order management, we can enable eCommerce merchants to have a complete online store solution by providing support and development on multiple eCommerce platforms including Solid Cactus eCommerce, Yahoo! Store, eBay Prostores and Webstore by Amazon. Customers work directly with store development project managers, designers and programmers to build high-end custom eCommerce stores. Dedicated Internet marketing managers coordinate Internet marketing spend to maximize natural and paid traffic, thereby increasing end-customer sales through their eCommerce store. As end-customer sales increase, our eCommerce call center provides end-customer sales and customer support for our eCommerce merchants, freeing up time and resources for eCommerce merchants to focus on growing their business. We have invested significant time and capital resources in a set of internal processes and proprietary technologies designed to enable high-scale, high-quality mass customization of our Web services. The workflow of our sales and fulfillment process for eWorks! XL and SmartClicks is illustrated below. Utilizing leads provided by our strategic marketing relationships, as well as leads acquired directly, we identify potential customers through a combination of our outbound and inbound telesales programs. Once our sales specialists have determined that a lead is a potential customer, the customer call is transferred directly to a Web services consultant. In most cases, this transfer takes place immediately so that customer contact is not interrupted. The Web services consultant conducts a Web design interview during which we collect information about the customer, request customer-specific content, and proactively help the customer design an effective online presence based on the goals for business. Several discrete quality checks on each sale help us maximize the quality of the sale. Using our proprietary workflow process and customer relationship management software, the interview notes and content gathered by our Web services consultants are then transmitted to our national design center. At this point, our design specialists use the notes and content collected, our proprietary design tool and one of hundreds of design templates that can be modified using a wide variety of color themes and graphics to design a semi-custom website for the customer. After completion of the website, a separate quality assurance process is automatically triggered by our proprietary workflow process and customer relationship management software. This quality assurance process includes testing of the website, reviewing notes and customer-supplied content, confirming appropriateness of styles used, and generally ensuring that the quality of the resulting online presence is consistent with our high standards. Following quality assurance, the website is published and hosted, and the customer is notified that the website is complete. By utilizing our proprietary workflow process and customer relationship management software, specialized design tools, a large database of design templates, and several years of experience, we have been able to decrease the time of development and increase the utilization rate of our sales, design, and support staff. Our goal is to complete this process, from customer call to initial website deployment, within 72 hours. After the website is available on the Internet, we help our customers maintain, modify, and upgrade their online presence. For all of our customers, we also provide periodic newsletters and other informational items to increase our number of customer contact events. We actively seek to interact with our customers at a variety of times during the customer life cycle through different media. Through experience and testing, we have found increased contact with customers helps to improve customer loyalty and enhance their understanding of the value of our services and products. We have also initiated several programs to foster customer loyalty, including numerous customer surveys that measure the quality of our service and the effectiveness of our products, a dedicated customer satisfaction team that follows up telephonically with every customer responding negatively to any of our surveys, segmented design experts for handling design changes quickly and professionally, and the introduction of an intensive training curriculum required for all customer care agents. We maintain five data centers located in Jacksonville, Florida; Atlanta, Georgia; Spokane, Washington; and Ontario, Canada for most of our internal operations. Servers that provide our customers’ website data to the Internet are located within third-party co-location facilities located in Jacksonville, Florida and Atlanta, Georgia. These co-location facilities have a secured network infrastructure including intrusion detection at the router level. Our contract obligates our co-location provider to provide us a secured space within their overall data center. The facilities are secured through card-key numeric entry and biometric access. Infrared detectors are used throughout the facility. In addition, the co-location facilities are staffed 24 hours a day, 7 days a week, with experts to manage and monitor the carrier networks and network access. The co-location facilities’ staff provides 24-hour security through camera-controlled views of our equipment. The co-location facilities provide multiple Internet carriers to help ensure bandwidth availability to our customers. The availability of electric power at the co-location facilities are provided through multiple uninterruptible power supply and generator systems should power supplied by the Jacksonville Electric Authority or Georgia Power fail. Customer data is redundant through the use of multiple application and Web servers. Customer data is backed up to other disk arrays with fail-over to help ensure high availability. Customer data is also maintained at our national design center and can be republished from archival data at any time through our Oracle 9i database system. Currently, this process could take approximately 24 hours. Our financial system reporting also uses our redundant Oracle systems and can be reconstituted in approximately 12 hours. We are currently working with our co-location provider to establish a disaster recovery backup operation at one of the provider’s alternative locations. This would provide a working fail-over site to prevent a disruption of our customers’ websites should the Jacksonville co-location site become unavailable. The facilities are connected by fiber-optic rings to our co-location provider’s other centers. Potential customers for our search engine marketing packages are identified primarily using outbound telesales programs based in Manassas, Virginia. This program targets businesses with established traditional print yellow pages advertising campaigns. Customers who purchase our online marketing package offering are interviewed and advertising information is entered into our proprietary publishing system. Local advertisements are then customized for several distribution platforms, such as Yahoo! Yellow Pages and Google search, and then published to these platforms. Customers receive a monthly report that tracks the number of impressions, clicks, and calls generated by each advertisement that we place on their behalf. In addition to selling online marketing packages, we sell website and search engine optimization services to this customer base. Prospects for our 1ShoppingCart.com and Solid Cactus eCommerce products are typically small business customers that are interested in establishing an online business. Our eCommerce engine integrates a variety of marketing and advertising modules that can be purchased as a bundle, or sold individually. In addition to establishing their business online, our customers can market their services through our e-mail marketing system and auto-responders, track the effectiveness of their advertising and marketing efforts and establish, manage and maintain a robust affiliate program. Potential customers can also test our services through a paid or free online trial. Once a customer downloads the trial of our software, we contact them through a series of direct outbound calls, e-mail communications and auto-responders to encourage conversion of the trial to a paid subscription and to upsell other services. Our customer data is stored on systems that are compliant and certified to meet Visa International’s Payment Card Industry Data Standards. We have a highly available redundant infrastructure, which provides disaster recovery backup to prevent a disruption of our customers’ eCommerce presence. We offer a suite of merchant processing solutions to 1ShoppingCart.com, Do-It-For-Me, Do-It-Yourself, and Renex customers that help customers save money on processing credit and debit card transactions. These services are offered through strategic partnerships with merchant services providers who analyze our customers’ existing processing fees to determine potential cost savings for existing processors and establish new merchant services accounts for customers who need to begin taking credit cards. In addition to savings on processing fees, this service offers fraud detection and card security compliance features. Merchant services are sold primarily through online and email marketing campaigns targeting our customers that accept credit and debit cards. Once a prospect is identified through these channels, they receive a call from our payment processing processors to complete a cost analysis and close the sale. We market our Lead Generation services to homeowners through online advertising and identify contractors primarily using an outbound telesales programs based in Manassas, Virginia and Jacksonville, Florida. Homeowners complete an online project questionnaire which describes their home remodeling project. We receive the online lead and send it to local contractors in our database. Some qualified contractors that respond are provided the homeowner’s full contact information and then the contractor works directly with the homeowner to scope the project and to provide cost estimates to the homeowner. We also offer lead generation products through our outbound telesales efforts to small businesses in a variety of industries including home services. In addition, we offer a Customer Relationship Lead Management system (CRM system) to contractors, that allow them to manage all of their leads and projects in a comprehensive, easy-to-use system. Based in Scottsdale, Arizona, Web.com Search Agency (formerly Submitawebsite.com) offers search engine optimization and placement services to customers that want to improve their natural search rankings in popular search engines. These services are marketed to small and medium-sized businesses through organic search and online marketing. Additionally, these services are cross-sold to our customers through our outbound and inbound telesales teams. Web.com Search Agency services align customers’ website code and content with strategic keyword phrase targeting, ultimately assisting a search engine algorithm in understanding and recognizing a website’s keyword focus. We also sell and manage link building and blogging campaigns for customers as additional strategies to improve search engine rankings and website performance. LogoYes services are purchased directly from the LogoYes.com website where customers can build a custom, professional logo for their business as part of their brand-building efforts. Customers can also extend their brand identity by ordering business cards through the LogoYes site. Web.com’s Do-It-Yourself customers can purchase LogoYes brand-building services directly through their account control panel. Additionally, we build logos for our Do-It-For-Me customers using the LogoYes technology. Solid Cactus Call Center services help eliminate for our customers the guess work and costly overhead associated with hiring in-house customer service employees for our customers. On May 26, 2009, we sold our NetObjects Fusion software business for an aggregate of $4.0 million. We no longer consider the NetObjects Fusion license software product core to our predominantly subscription business model. The NetObjects Fusion software business enabled customers to build websites either for themselves or for others. We have received a partial payment of one million dollars in connection with the NetObjects Fusion sale. The remaining $3.0 million of proceeds is expected to be paid over the next several years with payments to us being based upon a formula based on estimated revenue, and we expect the entire balance to be paid by May 26, 2013. Our hardware and software infrastructure provides an advanced set of integrated tools for design, service, modifications, and billing. MatrixBuilder enables website design, end user modification and administration, and includes a variety of other tools accessible by our customers. Our Oracle-based proprietary workflow processes and customer relationship management software, which we developed internally, help ensure that our production staff provides timely and efficient design services and helps us to efficiently and cost-effectively manage our customer base. Account Management. The account management module facilitates the creation and maintenance of a customer account and the consolidation, either manually or electronically through external submission, of pertinent customer demographics, product specifics, and billing information. We track critical aspects of customer activity, which allows customer service representatives to have immediate access to a customer’s complete account history. Design Tool. Our design tool, MatrixBuilder, is browser-based, supports major Web services standards, and can be easily co-branded or private labeled for an organization with which we have a strategic relationship. MatrixBuilder is template-based, yet can provide thousands of different website styles by using hundreds of design templates that can be modified using a wide variety of color themes and graphics. The design tool generates the HTML code, so that manual coding is not required, and facilitates the generation of domain name registration, an eCommerce storefront, and a number of other extended and value added services that our customers can access from any Web browser. Workflow Module. The workflow module expedites service and product delivery by automatically determining the required production path, such as design, quality control, or submission to search engines, based on the specific attributes of the customer or service. The workflow module also controls production flow through our organization, enabling our design and customer support staff to individually service our website customers either by routing their work automatically to the correct department or handling the request themselves. Billing Module. The billing module enables us to bill our subscription and custom design customers directly or to bill a third party in the aggregate for its end users. The billing module is integrated with a number of transaction processing tools enabling support for many different payment types. Search Engine Marketing and Tracking System. We operate a proprietary publishing and tracking system that allows the automated building, publishing, and tracking of advertisement campaigns. These campaigns currently are published on Yahoo!, Google, SuperMedia.com (formerly Idearc and Verizon Superpages), Switchboard, Looksmart and other sites affiliated with these providers. Lead Generation. Our proprietary software application enables us to systematically manage the relationships and interactions with homeowners and contractors in our database, enhancing the efficiency and productivity of our sales and account management teams. The Web.com proprietary technology includes technologies that enable the company to automate a number of back-end functions and technologies that allow customers to order, change and manage their web hosting accounts easily online without technical expertise. Outbound and Inbound Telesales. The organizations with which we have strategic marketing relationships provide us with lists of their small and medium-sized business clients who meet a broad set of criteria. We also acquire lead lists directly from other third parties. We analyze these customer lists to determine which of these customers best match our criteria for long-term clients. Our sales specialists call these prospective customers during regular business hours to discuss their Web services needs. We believe the brand and affinity relationship these prospective customers have with the parties with which we have strategic marketing relationships enhances our ability to reach a decision maker, make a presentation, have our offer considered, and close the sale during the initial call. In addition, we maintain a separate team of sales specialists specifically focused on responding to inbound inquiries generated by programs initiated by us and the organizations with which we have strategic marketing relationships. We and these organizations employ a mix of e-mail, direct mail, website, and other marketing efforts to help promote our services to prospective clients. As of December 31, 2009, we had 199 employees in our outbound and inbound telesales units located in our sales centers in Spokane, Washington; Manassas, Virginia; Jacksonville, Florida; Atlanta, Georgia; Scottsdale, Arizona; Barrie, Ontario; Halifax, Nova Scotia; and Shavertown, Pennsylvania. With the benefit of having conducted several years of outbound and inbound telesales activities, we have significant management, business process, training, and product expertise within our sales team. Additionally, we employ practices designed to optimize the management of our employees and increase their sales performance. Reseller Program. Several of the parties with which we have strategic marketing relationships have their own direct sales organizations. We have worked closely with these resellers to develop sales support and fulfillment processes that integrate with the resellers’ sales, service, support, and billing practices. Additionally, we provide these resellers with training and sales materials to support the Web services being offered. Online Channel. We promote our services through the Web.com, Leads.com, RenovationExperts.com, 1ShoppingCart.com, Solidcactus.com, Submitawebsite.com, Logoyes.com and Globenetix.com websites. To drive prospects to our sites, we engage in online marketing and advertising campaigns, conduct targeted television campaigns to reach homeowners for Renex and participate in seminars targeting small businesses that wish to sell their services online. Our partners also promote our services by including our products on their websites and by including our services in their ongoing marketing and promotional efforts with their customers. Affiliate Network and Private Label Partners. We sell our shopping cart and business automation solutions through direct online channels and through approximately 3,000 affiliate and private-label partners that market our services on our behalf. These partners are provided with ongoing marketing and technical support to ensure a positive customer experience for their end customers. Through Web.com, we have approximately 5,000 affiliate partners that have the ability to sell our Do-It-Yourself services. We also have a network of direct resellers for our hosting products. We believe that these affiliate partners and resellers provide additional opportunities to upsell and cross-sell our Do-It-For-Me services. A key part of our sales strategy is to leverage the brand and distribution of organizations with which we have strategic marketing relationships to sell our Web services and products. We have developed strategic marketing relationships with well-known, brand name companies. We create sales material with each of these organizations, highlighting our Web services and products while also leveraging their brand. Then, on behalf of these companies, we initiate programs where our sales representatives directly contact their small and medium-sized business customers using telesales solicitation, direct mail, and online contact. We offer a number of benefits to the companies with whom we have established strategic marketing relationships. First, they are able to increase their revenue through the marketing fees paid by us. Second, we allow these companies to offer a comprehensive solution for delivering Web services to their small and medium-sized business customers. This can result in increased loyalty of their customer base and an overall strengthening of their customer relationships. Third, by providing our Web services to their customers through us, we enable them to differentiate their offering from that of their competitors. We generally target small and medium-sized businesses having fewer than 100 employees. These customers normally are focused on regional or local markets. We seek to create long-term relationships with our customers, who cover a diverse set of industries and geographies in the United States. As of December 31, 2009, we had approximately 275,000 subscribers to our eWorks! XL, SmartClicks, and other subscription-based services. We also target small and medium-sized businesses with significant monthly spending on local print yellow pages advertising. We seek to create long-term relationships with these businesses by helping them locate new customers at a significantly lower cost per lead compared to traditional print yellow pages marketing campaigns. We offer some of our services to our customers through third-party technology vendors, which helps us to expand our services and create additional revenue opportunities. We do not have long-term contracts with any of these third parties. Accordingly, we or any of these providers can terminate the relationship at any time, for any reason or no reason, on short notice, often as little as 30 days. If any of these relationships terminate, we may need to seek an alternative provider of services or develop the covered services independently. The market for Web services is highly competitive and evolving. We expect competition to increase from existing competitors as well as new market entrants. Most existing competitors typically offer a limited number of specialized solutions and services, but may provide a more comprehensive set of services in the future. These competitors include, among others, website designers, Internet service providers, Internet search engine providers, local business directory providers, website domain name registrars, eCommerce service providers, lead generation companies and hosting companies. These competitors may have greater resources, more brand recognition, and larger installed bases of customers than we do, and we cannot ensure that we will be able to compete favorably against them. Our success and ability to compete is dependent in significant part on our ability to develop and maintain the proprietary aspects of our technology and operate without infringing upon the proprietary rights of others. We currently rely primarily on a combination of copyright, trade secret and trademark laws, confidentiality procedures, contractual provisions, and other similar measures to protect our proprietary information. As of December 31, 2009, we owned 21 issued U.S. patents. We also have several additional patent applications pending but not yet issued. Due to the rapidly changing nature of applicable technologies, we believe that the improvement of existing offerings, reliance upon trade secrets and unpatented proprietary know-how and development of new offerings generally will continue to be our principal source of proprietary protection. While we have hired third party contractors to help develop our software and to design websites, we own the intellectual property created by these contractors. Our software is not substantially dependent on any third party software, although our software does utilize open source code. Notwithstanding the use of this open source code, we do not believe our usage requires public disclosure of our own source code nor do we believe the use of open source code is material to our business. We also have an ongoing service mark and trademark registration program pursuant to which we register some of our product names, slogans and logos in the United States and in some foreign countries. License agreements for our software include restrictions intended to protect our intellectual property. These licenses are generally non-transferable and are perpetual. In addition, we require all of our employees, contractors and many of those with whom we have business relationships to sign non-disclosure and confidentiality agreements and to assign to us in writing all inventions created while working for us. Some of our products also include third-party software that we obtain the rights to use through license agreements. In such cases, we have the right to distribute or sublicense the third-party software with our products. We have entered into confidentiality and other agreements with our employees and contractors, including agreements in which the employees and contractors assign their rights in inventions to us. We have also entered into nondisclosure agreements with suppliers, distributors and some customers to limit access to and disclosure of our proprietary information. Nonetheless, neither the intellectual property laws nor contractual arrangements, nor any of the other steps we have taken to protect our intellectual property can ensure that others will not use our technology, or that others will not develop similar technologies. We license, or lease from others, many technologies used in our services. We expect that we and our customers could be subject to third-party infringement claims as the number of websites and third party service providers for Web-based businesses grows. Although we do not believe that our technologies or services infringe the proprietary rights of any third parties, we cannot ensure that third parties will not assert claims against us in the future or that these claims will not be successful. As of December 31, 2009, we had a total of 788 employees. None of our employees are represented by unions. We consider the relationship with our employees to be good and have not experienced interruptions of operations due to labor disagreements. Web.com Group, Inc. was incorporated under the General Corporate Law of the State of Delaware on March 2, 1999. Our principal offices are located at 12808 Gran Bay Parkway West, Jacksonville, Florida 32258. Our telephone number is (904) 680-6600 and our website is located at www.web.com. Our website and the information contained therein or connected thereto shall not be deemed to be incorporated into this Form 10-K.
We make available free of charge on or through our Internet website our annual reports on Form 10-K, quarterly reports on Form 10-Q, current reports on Form 8-K and all amendments to those reports as soon as reasonably practicable after such material is electronically filed with or furnished to the Securities Exchange Commission (SEC). You may read and copy this Form 10-K at the SEC’s public reference room at 450 Fifth Street, NW, Washington D.C. 20549. Information on the operation of the public reference room can be obtained by calling the SEC at 1-800-SEC-0330. The SEC maintains an Internet site that contains reports, proxy and information statements and other information regarding our filings at www.sec.gov. Depressed general economic conditions or adverse changes in general economic conditions could adversely affect our operating results. If economic or other factors negatively affect the small and medium-sized business sector, our customers may become unwilling or unable to purchase our Web services and products, which could cause our revenue to decline and impair our ability to operate profitably. As our business has grown, we have become increasingly subject to the risks arising from adverse changes in domestic and global economic conditions. Uncertainty about future economic conditions makes it difficult for us to forecast operating results and to make decisions about future investments. For example, the direction and relative strength of the global economy has recently been increasingly uncertain due to softness in the residential real estate and mortgage markets, volatility in fuel and other energy costs, difficulties in the financial services sector and credit markets, continuing geopolitical uncertainties and other macroeconomic factors affecting spending behavior. If economic growth in the United States is slowed, or if other adverse general economic changes occur or continue, many customers may delay or reduce technology purchases or marketing spending. This could result in reductions in sales of our Web services and products, longer sales cycles, and increased price competition. Our existing and target customers are small and medium-sized businesses. We believe these businesses are more likely to be significantly affected by economic downturns than larger, more established businesses. For instance, the current global financial crisis affecting the banking system and financial markets and the possibility that financial institutions may consolidate or go out of business have resulted in a tightening in the credit markets, which could limit our customers’ access to credit. Additionally, these customers often have limited discretionary funds, which they may choose to spend on items other than our Web services and products. If small and medium-sized businesses experience economic hardship, or if they behave more conservatively in light of the general economic environment, they may be unwilling or unable to expend resources to develop their online presences, which would negatively affect the overall demand for our services and products and could cause our revenue to decline. Most of our Web services are sold on a month-to-month basis, and if our customers are unable or choose not to subscribe to our Web services, our revenue may decrease. Typically, our Web service offerings are sold pursuant to month-to-month subscription agreements, and our customers can generally cancel their subscriptions to our Web services at any time with little or no penalty. Historically, we have experienced a high turnover rate in our customer base. For the years ended December 31, 2009 and 2008, 35% and 46%, respectively, of our subscribers who were customers at the beginning of the respective year were no longer subscribers at the end of the respective year. The turnover rate calculations do not include any acquisition related customer activity. While we cannot determine with certainty why our subscription renewal rates are not higher, we believe there are a variety of factors, which have in the past led, and may in the future lead, to a decline in our subscription renewal rates. These factors include the cessation of our customers’ businesses, the overall economic environment in the United States and its impact on small and medium-sized businesses, the services and prices offered by us and our competitors, and the evolving use of the Internet by small and medium-sized businesses. If our renewal rates are low or decline for any reason, or if customers demand renewal terms less favorable to us, our revenue may decrease, which could adversely affect our stock price. Our ability to successfully pursue our growth strategy will depend on our ability to attract, retain, and motivate key employees across our business. We have many key employees throughout our organization that do not have non-compete agreements and may leave to work for a competitor at any time. In particular, we are substantially dependent on our telesales and customer service employees to obtain and service new customers. Competition for such personnel and others can be intense, and there can be no assurance that we will be able to attract, integrate, or retain additional highly qualified personnel in the future. In addition, our ability to achieve significant growth in revenue will depend, in large part, on our success in effectively training sufficient personnel in these two areas. New hires require significant training and in some cases may take several months before they achieve full productivity, if they ever do. Our recent hires and planned hires may not become as productive as we would like, and we may be unable to hire sufficient numbers of qualified individuals in the future in the markets where we have our facilities. If we are not successful in retaining our existing employees, or hiring, training and integrating new employees, or if our current or future employees perform poorly, growth in the sales of our services and products may not materialize and our business will suffer. During the course of our history, we have completed several acquisitions of other businesses, and a key element of our strategy is to continue to acquire other businesses in the future. In particular, we completed the Solid Cactus acquisition in April 2009. Integrating this recently acquired business and assets and any businesses or assets we may acquire in the future could add significant complexity to our business and additional burdens to the substantial tasks already performed by our management team. In the future, we may not be able to identify suitable acquisition candidates, and if we do, we may not be able to complete these acquisitions on acceptable terms or at all. In connection with our recent and possible future acquisitions, we may need to integrate operations that have different and unfamiliar corporate cultures. Likewise, we may need to integrate disparate technologies and Web service and product offerings, as well as multiple direct and indirect sales channels. The key personnel of the acquired company may decide not to continue to work for us. These integration efforts may not succeed or may distract our management’s attention from existing business operations. Our failure to successfully manage and integrate these current acquisitions, or any future acquisitions could seriously harm our business. Acquisitions involve the integration of companies that have previously operated independently. We expect that acquisitions may result in financial and operational benefits, including increased revenue, cost savings and other financial and operating benefits. We cannot be certain, however, that we will be able to realize increased revenue, cost savings or other benefits from any acquisition, or, to the extent such benefits are realized, that they are realized timely. Integration may also be difficult, unpredictable, and subject to delay because of possible cultural conflicts and different opinions on product roadmaps or other strategic matters. We may integrate or, in some cases, replace, numerous systems, including those involving management information, purchasing, accounting and finance, sales, billing, employee benefits, payroll and regulatory compliance, many of which may be dissimilar. Difficulties associated with integrating an acquisition’s service and product offering into ours, or with integrating an acquisition’s operations into ours, could have a material adverse effect on the combined company and the market price of our common stock. charges to income to eliminate certain of our pre-merger activities that duplicate those of the acquired company or to reduce our cost structure. Though we were profitable for the years ended December 31, 2005, 2006, 2007 and 2009, we were not profitable for the year ended December 31, 2008 and we may not become or stay profitable in the future. Although we generated net income for the years ended December 31, 2005, 2006, 2007, and 2009, we have not historically been profitable, were not profitable for the year ended December 31, 2008, and may not be profitable in future periods. As of December 31, 2009, we had an accumulated deficit of approximately $151.4 million. We expect that our expenses relating to the sale and marketing of our Web services, technology improvements and general and administrative functions, as well as the costs of operating and maintaining our technology infrastructure, will increase in the future. Accordingly, we will need to increase our revenue to be able to again achieve and, if achieved, to later maintain profitability. We may not be able to reduce in a timely manner or maintain our expenses in response to any decrease in our revenue, and our failure to do so would adversely affect our operating results and our level of profitability. We depend on our strategic marketing relationships to identify prospective customers. The loss of several of our strategic marketing relationships, or a reduction in the referrals and leads they generate, would significantly reduce our future revenue and increase our expenses. As a key part of our strategy, we have entered into agreements with a number of companies pursuant to which these parties provide us with access to their customer lists and allow us to use their names in marketing our Web services and products. Approximately 10% of our new customers in the year ended December 31, 2009 and approximately 18% of our new customers in the year ended December 31, 2008, were identified through our strategic marketing relationships. We believe these strategic marketing relationships are critical to our business because they enable us to penetrate our target market with a minimum expenditure of resources. If these strategic marketing relationships are terminated or otherwise fail, our revenue would likely decline significantly and we could be required to devote additional resources to the sale and marketing of our Web services and products. We have no long-term contracts with these organizations, and these organizations are generally not restricted from working with our competitors. Accordingly, our success will depend upon the willingness of these organizations to continue these strategic marketing relationships. To successfully execute our business plan, we must also establish new strategic marketing relationships with additional organizations that have strong relationships with small and medium-sized businesses that would enable us to identify additional prospective customers. If we are unable to diversify and extend our strategic marketing relationships, our ability to grow our business may be compromised. As a result of these factors, and in light of current global and U.S. economic conditions, we believe that our quarterly revenue and results of operations are likely to vary significantly in the future and that period-to-period comparisons of our operating results may not be meaningful. The results of one quarter may not be relied on as an indication of future performance. If our quarterly revenue or results of operations fall below the expectations of investors or securities analysts, the price of our common stock could decline substantially. Make it more difficult for the Company to attract new customers. Our data centers are maintained by third parties. A substantial portion of the network services and computer servers we utilize in the provision of services to customers are housed in data centers owned by other service providers. In particular, a significant number of our servers are housed in data centers in Atlanta, Georgia, Jacksonville, Florida, and Ontario, Canada. We obtain Internet connectivity for those servers, and for the customers who rely on those servers, in part through direct arrangements with network service providers and in part indirectly through the owners of those data centers. We also utilize other third-party data centers in other locations. In the future, we may house other servers and hardware items in facilities owned or operated by other service providers. Website domain name providers and hosting companies. Many of our current and potential competitors have longer operating histories, significantly greater financial, technical, marketing and other resources, greater brand recognition and, we believe, a larger installed base of customers. These competitors may be able to adapt more quickly to new or emerging technologies and changes in customer requirements. They may also be able to devote greater resources to the promotion and sale of their services and products than we can. If we fail to compete successfully against current or future competitors, our revenue could increase less than anticipated or decline, and our business could be harmed. As a result of the anticipated increase in competition in our market, and the likelihood that some of this competition will come from companies with established brands, we believe brand name recognition and reputation will become increasingly important. Our strategy of relying significantly on third-party strategic marketing relationships to find new customers may impede our ability to build brand awareness, as our customers may wrongly believe our Web services and products are those of the parties with which we have strategic marketing relationships. If we do not continue to build brand awareness quickly, we could be placed at a competitive disadvantage to companies whose brands are more recognizable than ours. Changes in our industry occur very rapidly, including changes in the way the Internet operates or is used by small and medium-sized businesses and their customers. As a result, our Web services and products could become obsolete quickly. The introduction of competing products employing new technologies and the evolution of new industry standards could render our existing products or services obsolete and unmarketable. To be successful, our Web services and products must keep pace with technological developments and evolving industry standards, address the ever-changing and increasingly sophisticated needs of our customers, and achieve market acceptance. If we are unable to develop new Web services or products, or enhancements to our Web services or products, on a timely and cost-effective basis, or if new Web services or products or enhancements do not achieve market acceptance, our business would be seriously harmed. Providing Web services and products to small and medium-sized businesses designed to allow them to Internet-enable their businesses is a new and emerging market; if this market fails to develop, we will not be able to grow our business. Our success depends on a significant number of small and medium-sized business outsourcing website design, hosting, and management as well as adopting other online business solutions. The market for our Web services and products is relatively new and untested. Custom website development has been the predominant method of Internet enablement, and small and medium-sized businesses may be slow to adopt our template-based Web services and products. Further, if small or medium-sized businesses determine that having an online presence is not giving their businesses an advantage, they would be less likely to purchase our Web services and products. If the market for our Web services and products fails to grow or grows more slowly than we currently anticipate, or if our Web services and products fail to achieve widespread customer acceptance, our business would be seriously harmed. Effective internal controls are necessary for us to provide reliable and accurate financial reports. We will need to devote significant resources and time to comply with the requirements of Sarbanes-Oxley with respect to internal control over financial reporting. In addition, Section 404 under Sarbanes-Oxley requires that we assess and our auditors attest to the design and operating effectiveness of our controls over financial reporting. Our ability to comply with the annual internal control report requirement for our fiscal year ending on December 31, 2009 will depend on the effectiveness of our financial reporting and data systems and controls across our company and our operating subsidiaries. We expect these systems and controls to become increasingly complex to the extent that we integrate acquisitions and our business grows. To effectively manage this complexity, we will need to continue to improve our operational, financial, and management controls and our reporting systems and procedures. Any failure to implement required new or improved controls, or difficulties encountered in the implementation or operation of these controls, could harm our operating results or cause us to fail to meet our financial reporting obligations, which could adversely affect our business and jeopardize our listing on the NASDAQ Global Market, either of which would harm our stock price. We intend to continue to make investments to support our business growth and may require additional funds to respond to business challenges, including the need to develop new services and products or enhance our existing Web services, enhance our operating infrastructure and acquire complementary businesses and technologies. Accordingly, we may need to engage in equity or debt financings to secure additional funds. Financial market disruption and general economic conditions in which the credit markets are severely constrained and the depressed equity markets may make it difficult for us to obtain additional financing on terms favorable to us, if at all. If we raise additional funds through further issuances of equity or convertible debt securities, our existing stockholders could suffer significant dilution, and any new equity securities we issue could have rights, preferences and privileges superior to those of holders of our common stock. Any debt financing secured by us in the future could involve restrictive covenants relating to our capital raising activities and other financial and operational matters, which may make it more difficult for us to obtain additional capital and to pursue business opportunities, including potential acquisitions. If we are unable to obtain adequate financing or financing on terms satisfactory to us, when we require it, our ability to continue to support our business growth and to respond to business challenges could be significantly impaired. Item 201 (e). Performance Graph. The following graph shows the total stockholder return as of the dates indicated of an investment of $100 in cash on November 2, 2005 (the date the Company’s common stock was first publicly traded) for (i) the Company’s common stock, (ii) the Nasdaq Composite Index and (iii) the RDG Internet Composite Index. All values assume reinvestment of the full amount of any dividends, however, no dividends have been declared on our common stock to date. The stock price performance on the graph below is not necessarily indicative of future performance. *$100 invested on 11/2/05 in stock or 10/31/05 in index, including reinvestment of dividends. (1) This Section is not “soliciting material,” is not deemed “filed” with the SEC and is not to be incorporated by reference in any filing of the Company under the 1933 Act or the 1934 Act whether made before or after the date hereof and irrespective of any general incorporation language in any such filing. On August 2, 2006, Web.com Holding filed suit in the United States District Court for the Western District of Pennsylvania against Federal Insurance Company and Chubb Insurance Company of New Jersey, seeking insurance coverage and payment of litigation expenses with respect to litigation involving Web.com Holding pertaining to events in 2001. Web.com Holding also has asserted claims against Rapp Collins, a division of Omnicom Media, that are pending in state court in Pennsylvania for recovery of the same litigation expenses. These actions were consolidated in state court in Pennsylvania on September 30, 2008. On October 1, 2009, the parties entered into a confidential settlement agreement which resolved the lawsuit. The settlement did not have a material impact to the Consolidated Financial Statements. On June 19, 2006, Web.com Holding filed suit in the United States District Court for the Northern District of Georgia against The Go Daddy Group, Inc., seeking damages, a permanent injunction and attorney fees related to alleged infringement of four of Web.com Holdings’ patents. On January 8, 2009, the parties entered into a confidential settlement and patent cross-licensing agreement, which resolved the lawsuit. The revenue derived from the sale of the patent license is reflected in other revenue for the year ended December 31, 2009. The outcome of any litigation cannot be assured, and despite management’s views of the merits of any litigation, or the reasonableness of the Company’s estimates and reserves, the Company’s cash balances could nonetheless be materially affected by an adverse judgment. In accordance with ASC 450, Contingencies, the Company believes it has adequately reserved for the contingencies arising from the current legal matters where an outcome was deemed to be probable and the loss amount could be reasonably estimated. As such, the Company does not believe that the anticipated outcome of any current litigation will have a materially adverse impact on its financial condition, cash flows, or results of operations. Since October 27, 2008, our common stock has been listed on the NASDAQ Global Market under the symbol “WWWW”. Prior to such time, since November 1, 2005, our common stock has been listed on the NASDAQ Global Market under the symbol “WSPI”. Prior to November 1, 2005, there was no public market for our common stock. The following table sets forth the high and low stock prices of our common stock for the last two fiscal years as reported on the NASDAQ Global Market. The closing price for our common stock as reported by the NASDAQ Global Market on February 26, 2010 was $4.76 per share. As of February 26, 2010, there were approximately 538 stockholders of record of our common stock, not including those shares held in street or nominee name. We have never declared or paid any cash dividends on our capital stock. We currently intend to retain any future earnings to fund the development and expansion of our business, and therefore we do not anticipate paying cash dividends on our common stock in the foreseeable future. Any future determination to pay dividends will be at the discretion of our board of directors. None of our outstanding capital stock is entitled to any dividends. On September 4, 2008, we announced that our Board of Directors authorized the repurchase of up to $20 million of the Company’s outstanding common shares over the next eighteen months. On March 3, 2010, the Board of Directors extended the repurchase program for an additional twelve months. The timing, price and volume of repurchases will be based on market conditions, liquidity, relevant securities laws and other factors. The Company may terminate the repurchase program at any time without notice. The Company did not repurchase any outstanding common shares during the three months ended December 31, 2009. The remaining maximum dollar value that may be purchased under the plan is $7.8 million. See Note 6 to the Consolidated Financial Statements for information regarding businesses acquired during the years ended December 31, 2009, 2008 and 2007. Included in the net income for the year ended December 31, 2006 and 2009, respectively, is a tax benefit of $3.2 million and $1.4 million, respectively, which was the result of a reduction in the deferred tax asset reserve allowance. Included in the net loss for the year ended December 31, 2008 is a goodwill and intangible asset impairment charge of $102.6 million. The primary reason for the impairment charge was the decline of the Company’s stock price during the fourth quarter of 2008. In addition to historical information, this Form 10-K contains forward-looking statements within the meaning of Section 27A of the Securities Act of 1933 and Section 21E of the Securities Exchange Act of 1934. Actual results could differ materially from those projected in the forward-looking statements as a result of a number of factors, risks and uncertainties, including the risk factors set forth in Item 1A. above and the risk factors set forth in this discussion, especially under the captions “Variability of Results” and “Factors That May Affect Future Operating Results” in this Form 10-K. Generally, the words “anticipate”, “expect”, “intend”, “believe” and similar expressions identify forward-looking statements. The forward-looking statements made in this Form 10-K are made as of the filing date of this Form 10-K with the Securities and Exchange Commission, and future events or circumstances could cause results that differ significantly from the forward-looking statements included here. Accordingly, we caution readers not to place undue reliance on these statements. We expressly disclaim any obligation to update or alter our forward-looking statements, whether, as a result of new information, future events or otherwise after the date of this document. In the following discussion and analysis of results of operations and financial condition, certain financial measures may be considered “non-GAAP financial measures” under Securities and Exchange Commission rules. These rules require supplemental explanation and reconciliation, which is provided in this Annual Report on Form 10-K.
We are a leading provider of Do-It-For-Me and Do-It-Yourself website building tools, online marketing, lead generation and technology solutions that enable small and medium-sized businesses to build and maintain an effective online presence. We offer a full range of online services, including online marketing and advertising, local search, search engine marketing, search engine optimization, lead generation, home contractor specific leads, website design and publishing, logo and brand development and eCommerce solutions, meeting the needs of small businesses anywhere along their lifecycle. Our primary offerings, eWorks! XL and SmartClicks, are comprehensive performance-based packages that include website design and publishing, online marketing and advertising, search engine optimization, search engine submission, lead generation, hosting and email solutions, and easy-to-understand Web analytics. As an application service provider, or ASP, we offer our customers a full range of Web services and products on an affordable subscription basis. In addition to our primary service offerings, we provide a variety of premium services to customers who desire more advanced capabilities; such as eCommerce solutions and other sophisticated online marketing services and online lead generation. The breadth and flexibility of our offerings allow us to address the Web services needs of a wide variety of customers, ranging from those just establishing their websites to those that want to enhance their existing online presence with more sophisticated marketing and lead generation services. Additionally, as the Internet continues to evolve, we plan to refine and expand our service offerings to keep our customers at the forefront. Through the combination of our proprietary website publishing and management software, automated workflow processes, and specialized workforce development and management techniques, we believe that we achieve production efficiencies that enable us to offer sophisticated Web services at affordable rates. Our technology automates many aspects of creating, maintaining, enhancing, and marketing websites on behalf of our customers. With approximately 275,000 subscribers to our eWorks! XL, SmartClicks, and subscription-based services as of December 31, 2009, we believe we are one of the industry’s largest providers of affordable Web services and products enabling small and medium-sized businesses to have an effective online presence. We traditionally have sold our Web services and products to customers identified primarily through strategic relationships with established brand name companies that have a large number of small and medium-sized business customers. We have a direct sales force that utilizes leads generated by our strategic marketing relationships to acquire new customers at our sales centers in Spokane, Washington; Atlanta, Georgia; Jacksonville, Florida; Manassas, Virginia; Norton, Virginia; Halifax, Nova Scotia; Barrie, Ontario; and Scottsdale, Arizona. Our sales force specializes in selling to small and medium-sized businesses across a wide variety of industries throughout the United States. To increase our revenue and take advantage of our market opportunity, we plan to expand our subscriber base as well as increase our revenue from existing subscribers. We intend to continue to invest in hiring additional personnel, particularly in sales and marketing; developing additional services and products; adding to our infrastructure to support our growth; and expanding our operational and financial systems to manage our growing business. As we have in the past, we will continue to evaluate acquisition opportunities to increase the value and breadth of our Web services and product offerings and expand our subscriber base. We grow our subscriber base through a combination of adding new subscribers and retaining existing subscribers. We define net subscriber additions in a particular period as the gross number of new subscribers added during the period, less subscriber cancellations during the period. For this purpose, we only count as new subscribers those customers whose subscriptions have extended beyond the free trial period. Additionally, we do not treat a subscription as cancelled, even if the customer is not current in its payments, until either we have attempted to contact the subscriber twenty times or 60 days have passed since the most recent failed billing attempt, whichever is sooner. In any event, a subscriber’s account is cancelled if payment is not received within approximately 80 days. Monthly turnover is a metric we measure each quarter, and which we define as customer cancellations in the quarter divided by the sum of the number of subscribers at the beginning of the quarter and the gross number of new subscribers added during the period, divided by three months. Customer cancellations in the quarter include cancellations from gross subscriber additions, which is why we include gross subscriber additions in the denominator. In measuring monthly turnover, we use the same conventions with respect to free trials and subscribers who are not current in their payments as described above for net subscriber additions. Monthly turnover is the key metric that allows management to evaluate whether we are retaining our existing subscribers in accordance with our business plan. An increase in monthly turnover may signal deterioration in the quality of our service, or it may signal a behavioral change in our subscriber base. Lower monthly turnover signals higher customer retention. We derive our revenue from sales of a variety of services to small and medium-sized businesses, including web design, online marketing, search engine optimization, eCommerce solutions, logo design and home contractor lead services. Leads are generated through online advertising campaigns targeting customers in need of web design, hosting or online marketing solutions, through strategic partnerships with enterprise partners, or through our corporate websites. We currently derive a substantial majority of our revenue from fees associated with our subscription services, which are generally sold through our eWorks! XL, SmartClicks, Visibility Online, Web.com, Renex, 1ShoppingCart.com, and Solid Cactus offerings. A significant portion of our subscription contracts include the design of a five-page website, its hosting, and several additional Web services. In the case of eWorks! XL, upon the completion and initial hosting of the website, our subscription services are offered free of charge for a 30-day trial period during which the customer can cancel at any time. After the 30-day trial period has ended, the revenue is recognized on a daily basis over the life of the contract. No 30-day free trial period is offered to customers for our Visibility Online services, and revenue is recognized on a daily basis over the life of the contract. The typical subscription is a monthly contract, although terms range up to 12 months. We bill a majority of our customers on a monthly basis through their credit cards, bank accounts, or business merchant accounts. The Web.com product line subscription revenue is primarily generated from shared hosting, managed services, eCommerce services, applications hosting and domain name registrations. Revenue is recognized as the services are provided. Hosting contracts generally are for service periods ranging from one to 24 months and typically require up-front fees. These fees, including set-up fees for hosting services, are deferred and recognized ratably over the customer’s expected service period. Deferred revenue represents the liability for advance billings to customers for services not yet provided. For the year ended December 31, 2009, subscription revenue accounted for approximately 96% of our total revenue as compared to 98% and 97% for the years ended December 31, 2008 and 2007, respectively. The number of paying subscribers to our Web services and lead generation products drives subscription revenue as well as the subscription price that we charge for these services. The number of paying subscribers is affected both by the number of new customers we acquire in a given period and by the number of existing customers we retain during that period. We expect other sources of revenue to decline as a percentage of total revenue over time. We generate professional services revenue from custom website design, eCommerce store design, and Do-it-Yourself logo design. Our custom website design and eCommerce store design work is typically billed on a fixed price basis and over very short periods. Our Do-It-Yourself logo design is typically billed upon the point-of-sale of the final product, which is created by the customer. We occasionally generate revenue from the sale of perpetual licenses for use of our patents. Other revenue consists of all fees earned from granting customers licenses to use our patents. Cost of subscription revenue primarily consists of expenses related to marketing fees we pay to companies with which we have strategic marketing relationships as well as compensation expenses related to our Web page development staff, directory listing fees, customer support costs, domain name and search engine registration fees, allocated overhead costs, billing costs, and hosting expenses. We allocate overhead costs such as rent and utilities to all departments based on headcount. Accordingly, general overhead expenses are reflected in each cost of revenue and operating expense category. As our customer base and Web services usage grows, we intend to continue to invest additional resources in our website development and support staff. Our largest direct marketing expense are the costs associated with the online marketing channels we use to acquire and promote our services. These channels include search marketing, affiliate marketing and online partnerships. Sales costs consist primarily of salaries and related expenses for our sales and marketing staff. Sales and marketing expenses also include commissions, marketing programs, including advertising, events, corporate communications, other brand building and product marketing expenses and allocated overhead costs. As market conditions improve, we plan to continue to invest heavily in sales and marketing by increasing the number of direct sales personnel in order to add new subscription customers as well as increase sales of additional and new services and products to our existing customer base. Our investment in this area will also help us to expand our strategic marketing relationships, to build brand awareness, and to sponsor additional marketing events. Accordingly, we expect that, in the future, sales and marketing expenses will increase in absolute dollars. Research and development expenses consist primarily of salaries and related expenses for our research and development staff and allocated overhead costs. We have historically focused our research and development efforts on increasing the functionality of the technologies that enable our Web services and lead generation products. Our technology architecture enables us to provide all of our customers with a service based on a single version of the applications that serve each of our product offerings. As a result, we do not have to maintain multiple versions of our software, which enables us to have lower research and development expenses as a percentage of total revenue. We expect that, in the future, research and development expenses will increase in absolute dollars as we continue to upgrade and extend our service offerings and develop new technologies. General and administrative expenses consist of salaries and related expenses for executive, finance, administration, and management information systems personnel, as well as professional fees, other corporate expenses, and allocated overhead costs. We expect that general and administrative expenses will increase in absolute dollars as we continue to add personnel to support the growth of our business. Depreciation and amortization expenses relate primarily to our computer equipment, software, building and other intangible assets recorded due to the acquisitions we have completed. Our discussion and analysis of our financial condition and results of operations are based on our consolidated financial statements, which have been prepared in accordance with accounting principles generally accepted in the United States. The preparation of these financial statements requires us to make estimates and judgments that affect the reported amounts of assets, liabilities, and expenses and related disclosure of contingent assets and liabilities. We review our estimates on an ongoing basis. We base our estimates on historical experience and on various other assumptions that we believe to be reasonable under the circumstances, the results of which form the basis for making judgments about the carrying values of assets and liabilities. Actual results may differ from these estimates under different assumptions or conditions. While our significant accounting policies and estimates are described in more detail in Note 1 to our consolidated financial statements included in this report, we believe the following accounting policies to be critical to the judgments and estimates used in the preparation of our consolidated financial statements. We recognize revenue in accordance with ASC 605 Revenue Recognition. We recognize revenue when all of the following conditions are satisfied: (1) there is persuasive evidence of an arrangement; (2) the service has been provided to the customer; (3) the amount of fees to be paid by the customer is fixed or determinable; and (4) the collection of our fees is probable. Thus, we recognize subscription revenue on a daily basis, as services are provided. Customers are billed for the subscription on a monthly, quarterly, semi-annual, or annual basis, at the customer’s option. For all of our customers, regardless of their billing method, subscription revenue is recorded as deferred revenue in the accompanying consolidated balance sheets. As services are performed, we recognize subscription revenue on a daily basis over the applicable service period. When we provide a free trial period, we do not begin to recognize subscription revenue until the trial period has ended and the customer has been billed for the services. Professional services revenue is generated from custom website design, eCommerce store design, and Do-it-Yourself logo design. Our professional services revenue from contracts for custom website design is recorded using a proportional performance model based on labor hours incurred. The extent of progress toward completion is measured by the labor hours incurred as a percentage of total estimated labor hours to complete. Labor hours are the most appropriate measure to allocate revenue among reporting periods, as they are the primary input to the provision of our professional services. Our Do-It-Yourself logo design is typically billed upon the point-of-sale of the final product, which is created by the customer. We account for our multi-element arrangements, such as in the instances where we design a custom website and separately offer other services such as hosting and marketing, in accordance with ASC 605-25 Revenue Recognition: Multiple-Element Arrangement. We identify each element in an arrangement and assign the relative fair value to each element. The additional services provided with a custom website are recognized separately over the period for which services are performed. We record compensation expenses for our employee and director stock-based compensation plans based upon the fair value of the award in accordance with ASC 718, Compensation – Stock Compensation. Stock-based compensation is amortized over the related vesting periods. We granted to our employees options to purchase common stock at exercise prices equal to the quoted market values of the underlying stock at the time of each grant. Upon granting options to our employees, we valued the fair value of each option award, on the date of the grant, using the Black Scholes option valuation model. In accordance with ASC 350 Intangibles - Goodwill and Other, we periodically evaluate goodwill and indefinite lived intangible assets for potential impairment. We test for the impairment of goodwill and indefinite lived intangible assets annually, and between annual tests if an event occurs or circumstances change that would more likely than not reduce the fair value of goodwill or indefinite lived intangible assets below its carrying amount. Other intangible assets include, among other items, customer relationships, developed technology and non-compete agreements, and they are amortized using the straight-line method over the periods benefited, which is up to eight years. Other intangible assets represent long-lived assets and are assessed for potential impairment whenever significant events or changes occur that might impact recovery of recorded costs. During the year ended December 31, 2009, we completed our annual impairment test of goodwill and other indefinite lived intangible assets. The results of this test determined that goodwill and other indefinite lived intangible assets were not impaired at December 31, 2009. See Note 9 “Goodwill and Intangible Assets” in the consolidated financial statements for additional information on goodwill and intangible assets. All of our acquisitions were accounted for as purchase transactions, and the purchase price was allocated to the assets acquired and liabilities assumed based on the fair value of the assets acquired and liabilities assumed. The excess of the purchase price over the fair value of net assets acquired or net liabilities assumed, was allocated to goodwill. Management weighed several factors in determining the fair value of amortizable intangibles, which primarily consists of customer relationships, non-compete agreements, trade names, and developed technology, including using valuation studies as one of many tools in determining the fair value of amortizable intangibles. The Company accounts for income taxes under the provisions of ASC 740 Income Taxes, using the liability method. ASC 740 requires recognition of deferred tax liabilities and assets for the expected future tax consequences of events that have been included in the financial statements or tax returns. Under this method, deferred tax liabilities and assets are determined based on the difference between the financial statement and tax basis of assets and liabilities using enacted tax rates in effect for the year in which the difference is expected to reverse. Further, deferred tax assets are recognized for the expected realization of available net operating loss carry forwards. A valuation allowance is recorded to reduce a deferred tax asset to an amount that we expect to realize in the future. We review the adequacy of the valuation allowance on an ongoing basis and recognize these benefits if a reassessment indicates that it is more likely than not that these benefits will be realized. In addition, we evaluate our tax contingencies on an ongoing basis and recognize a liability when we believe that it is probable that a liability exists and that the liability is measurable. In accordance with ASC 740, the Company annually evaluates the need for a valuation allowance on its deferred tax assets based on cumulative profits generated in the most recent three-year period as well as other positive evidence. As a result of this evaluation, the Company recognized a net tax benefit of $1.4 million for the year ended December 31, 2009. There was no adjustment to the valuation allowance necessary for the year ended December 31, 2008. Total revenue decreased 11% to $106.5 million in the year ended December 31, 2009 from $120.1 million in the year ended December 31, 2008. Total revenue during the year ended December 31, 2009 declined primarily due to decreases in our average revenue per subscriber as compared to the same period of the prior year. Subscription Revenue. Subscription revenue decreased 13% to $102.2 million in the year ended December 31, 2009 from $117.3 million in the year ended December 31, 2008. Subscription revenue decreased approximately $17.5 million primarily due to decreases in our average revenue per subscriber as compared to the prior year, which was slightly offset by additional revenue of $3.2 million from our recent acquisition. The decrease in average revenue per subscriber was mainly due to the addition of lower revenue subscribers from our Do-It-Yourself website building and hosting products as well as a reduction in spending by our enterprise partner subscribers. Net subscribers increased 9,368 during the year ended December 31, 2009, compared to an increase of 2,393 in the year ended December 31, 2008. The average monthly turnover decreased to 3.6% in the year ended December 31, 2009 from 4.0% in the year ended December 31, 2008. Due to the current economic conditions and lower marketing spend, gross subscriber additions were down from 150,017 during the year ended December 31, 2008 to 139,521 during the year ended December 31, 2009. Professional Services Revenue. Professional services revenue increased 20% to $3.3 million in the year ended December 31, 2009 from $2.8 million in the year ended December 31, 2008. Professional services revenue increased approximately $1.9 million from the additional service offerings of eCommerce store design and logo design that were acquired as part of our recent acquisitions, which was partially offset by a decrease of $915 thousand and $348 thousand in search engine optimization services and custom design services, respectively. Other Revenue. Other revenue increased to $1.0 million in the year ended December 31, 2009 from $100 thousand in the year ended December 31, 2008. This revenue was earned by the sale of a perpetual license for the use of our patents. Cost of Subscription Revenue. Cost of subscription revenue decreased 10% to $38.3 million in the year ended December 31, 2009 from $42.6 million in the year ended December 31, 2008. During the year ended December 31, 2009, we reduced costs by approximately $4.3 million, driven by the decline of our subscription revenue and offset by additional expense of $1.7 million due to the revenue associated with our recent acquisition. In addition, as a lesser percentage of our sales came from our strategic marketing relationships, fees related to these relationships decreased by $1.6 million during the year ended December 31, 2009. Our gross margin on subscription revenue declined slightly to 63% during the year ended December 31, 2009 from 64% during the year ended December 31, 2008. Cost of Professional Services Revenue. Cost of professional services revenue increased 59% to $2.1 million in the year ended December 31, 2009 from $1.3 million in the year ended December 31, 2008. The increase was primarily the result of the additional costs of approximately $1.1 million related to the eCommerce store design revenue, which was partially offset by a reduction of $305 thousand in payroll expenses. Gross margin on professional services revenue decreased to 37% for the year ended December 31, 2009 as compared to 53% for the year ended December 31, 2008. The decrease of gross margin was a result of the lower gross margins of our new offerings due to the recent acquisition. Sales and Marketing Expenses. Sales and marketing expenses decreased 19% to $23.3 million, or 22% of total revenue, during the year ended December 31, 2009 from $28.7 million, or 24% of total revenue, during the year ended December 31, 2008. The decrease of $5.3 million in sales and marketing expenses was primarily the result of a reduction in online marketing spending during the year, as well as, a reduction in sales resources. Specifically, we experienced reductions in marketing and advertising expense of $2.7 million and employee compensation and benefits expense of $3.0 million, which was offset slightly by costs associated with our recent acquisition of $744 thousand. Research and Development Expenses. Research and development expenses decreased 5% to $8.5 million, or 8% of total revenue, during the year ended December 31, 2009 from $8.9 million, or 7% of total revenue, during the year ended December 31, 2008. During the year ended December 31, 2009, there was an overall decrease in employee compensation and benefits expense totaling $492 thousand, in addition to the reduction of costs associated with subcontracted labor totaling $133 thousand, which were offset in part by costs associated with our recent acquisition of $217 thousand. General and Administrative Expenses. General and administrative expenses decreased 1% to $19.1 million, or 18% of total revenue, during the year ended December 31, 2009 from $19.4 million, or 16% of total revenue, during the year ended December 31, 2008. Although costs remained relatively consistent during the year ended December 31, 2009, the Company had increases for additional legal expenses of $436 thousand, which were primarily associated with the sale of a perpetual license, in addition to, increases in employee compensation and stock compensation of $732 thousand. The Company also had additional expenses of $865 thousand due to the costs associated with our recent acquisition. These increases in general and administrative expenses were reduced by reserve adjustments of $987 thousand that the Company determined are no longer probable due to the expiration of the statute of limitations and other legal resolutions. In addition, due to current economic conditions, we proactively reduced our overall general and administrative expenses. Restructuring charges. Restructuring charges increased 422% to $1.9 million, or 2% of total revenue, during the year ended December 31, 2009 from $372 thousand, or less than 1% of total revenue, during the year ended December 31, 2008. During the year ended December 31, 2009, the Company recorded aggregate charges of $1.9 million for restructuring costs, which included approximately $1.2 million of stock compensation expense. In connection with the completion of the integration of the Web.com acquisition, the Company terminated certain employees and recorded related termination benefits, which increased restructuring charges. Depreciation and Amortization Expense. Depreciation and amortization expense decreased 1% to $13.3 million, or 12% of total revenue, during the year ended December 31, 2009 from $13.4 million, or 11% of total revenue, during the year ended December 31, 2008. Amortization and depreciation expenses are predominantly a result of tangible and intangible assets acquired. Goodwill and Asset Impairment. During the year ended December 31, 2009, based on our annual impairment test of goodwill and other indefinite lived intangible assets, there were no indicators of impairment. However, during the year ended December 31, 2008, the Company completed its annual impairment test of goodwill and other indefinite lived intangible assets and determined there was an impairment. The Company recorded a goodwill and intangible asset impairment charge of $102.6 million. The primary reason for the impairment charge was the decline of our stock price during the fourth quarter of 2008. Net Interest Income. Net interest income decreased 72% to $233 thousand, or less than 1% of total revenue, during the year ended December 31, 2009 from $822 thousand, or 1% of total revenue, during the year ended December 31, 2008. The decrease in interest income was due to a reduction in the interest rates of our investment instruments. Income tax benefit (expense). Income tax benefit increased to $1.4 million during the year ended December 31, 2009 as compared to the income tax expense of $125 thousand during the year ended December 31, 2008. The Company reevaluated the valuation allowance on its deferred tax assets as a result of cumulative taxable income generated in the most recent three-year period, forecasts of future taxable income as well as other positive evidence. The Company’s tax rate for the years ended December 31, 2009 and 2008 were (121.2%) and 0.1%, respectively. The increase in the tax benefit and decrease in tax rate was due to the net effect of the release of the valuation allowance. Discontinued operations. On May 26, 2009, the Company sold its NetObjects Fusion software business for approximately $4.0 million. The remaining $3.0 million of proceeds is expected to be paid over the next several years using a formula based on estimated revenue, with the entire balance expected to be paid by May 26, 2013. The remaining proceeds will be recorded as a gain in discontinued operations as cash payments are received. During the year ended December 31, 2009, the net gain of $808 thousand is included in “Gain on sale of discontinued operations, net of tax” on the Company’s Consolidated Statement of Operations. For the year ended December 31, 2009 and 2008, the revenue generated by the NetObjects Fusion software business was $428 thousand and $2.5 million and net income was $232 thousand and $170 thousand, respectively. Total revenue increased 50% to $120.1 million in the year ended December 31, 2008 from $80.1 million in the year ended December 31, 2007. Subscription Revenue. Subscription revenue increased 51% to $117.3 million in the year ended December 31, 2008 from $77.7 million in the year ended December 31, 2007. The increase in subscription revenue was primarily the result of $36.5 million of additional revenue from the acquisition of Web.com as well as an increase of $4.2 million due to the growth of the average number of customers over the prior year. These increases were partially offset by the $1.1 million impact of a decrease in our average revenue per subscriber as compared to the prior year. The decrease in average revenue per subscriber was due to the addition of lower revenue subscribers from our Do-It-Yourself website building and hosting products as well as a reduction in spending by our enterprise partner subscribers. Net subscribers increased 2,393 during the year ended December 31, 2008, compared to an increase of 9,636 in the year ended December 31, 2007, which excluded the customers acquired as part of the Web.com acquisition. The net subscriber additions includes approximately 9,300 customers that we acquired in September 2008. The average monthly turnover decreased to 4.0% in the year ended December 31, 2008 from 4.8% in the year ended December 31, 2007. Professional Services Revenue. Professional services revenue increased 15% to $2.8 million in the year ended December 31, 2008 from $2.4 million in the year ended December 31, 2007. Several events during the year ended December 31, 2008 contributed to the increase of professional service revenues. In June 2008, we acquired a Do-It-Yourself logo product to offer to our customers. Sales from this new product were approximately $355 thousand for the year ended December 31, 2008. In addition, revenue from search engine optimization services, originating from an acquisition completed in March 2007, increased approximately $352 thousand over the prior year. These increases were partially offset by the sale of certain customers unrelated to our core business, in April 2008, which resulted in a decrease of revenue of $173 thousand and a decrease of $157 thousand in our custom web design services. Other Revenue. Other revenue increased to $100 thousand in the year ended December 31, 2008. This revenue was earned by the sale of perpetual licenses for the use of our patents. Cost of Subscription Revenue. Cost of subscription revenue increased 32% to $42.6 million in the year ended December 31, 2008 from $32.4 million in the year ended December 31, 2007. The increase in the cost of subscription revenue was primarily the result of the additional costs of approximately $9.4 million related to the additional subscription revenue associated with customers acquired as part of our acquisitions in 2007. While total costs increased, our gross margin on subscription revenue increased to 64% for the year ended December 31, 2008 as compared to 58% in the year ended December 31, 2007. The increase of gross margin was a result of a better mix of higher margin revenue and the continued benefits of our migration and consolidation activities. Cost of Professional Services Revenue. Cost of professional services revenue remained constant at $1.3 million in the years ended December 31, 2008 and December 31, 2007. While total costs remained constant over the prior year, increases in costs related to the acquired Do-It-Yourself logo product and increased search engine optimization services were offset by decreases in the cost due to the sale of certain customers unrelated to our core business and a reduction in custom web design services. Gross margin on professional services revenue increased to 53% for the year ended December 31, 2008 as compared to 46% for the year ended December 31, 2007. The increase of gross margin was a result of a better mix of higher margin revenue. Sales and Marketing Expenses. Sales and marketing expenses increased 54% to $28.7 million, or 24% of total revenue, during the year ended December 31, 2008 from $18.7 million, or 23% of total revenue, during the year ended December 31, 2007. An increase of $7.3 million in expense was attributable to the addition of sales and marketing resources in connection with our acquisitions during 2007. During the year ended December 31, 2008, we had an increase in employee compensation and benefits cost of $2.0 million and facility expenses of approximately $261 thousand, which was offset by a reduction of $258 thousand in marketing and advertising expenses. Research and Development Expenses. Research and development expenses increased 127% to $8.9 million, or 7% of total revenue, during the year ended December 31, 2008 from $3.9 million, or 5% of total revenue, during the year ended December 31, 2007. This was primarily due to an increase of $3.9 million in additional research and development resources associated with our acquisitions in 2007. During the year ended December 31, 2008, we had an increase in compensation and benefits costs of approximately $1.2 million due to an increase in headcount from 68 at December 31, 2007 to 92 at December 31, 2008. General and Administrative Expenses. General and administrative expenses increased 17% to $19.4 million, or 16% of total revenue, during the year ended December 31, 2008 from $16.5 million, or 21% of total revenue, during the year ended December 31, 2007. Due to our acquisition in 2007, there was an increase of approximately $4.1 million of additional general and administrative expenses over the prior period. This was partially offset by a reduction of employee compensation and benefits expense of approximately $1.3 million, which was primarily the result of our migration and consolidation activities. Restructuring charges. During the years ended December 31, 2008 and 2007, we recorded $372 thousand and $243 thousand, respectively, for restructuring charges. During the year ended December 31, 2008, the Company restructured personnel in our operations and as a result of this reorganization terminated employees and recorded termination benefits of approximately $372 thousand. During the year ended December 31, 2007, the Company restructured our organization by terminating employees and closing facilities in Los Angeles, California and Seneca Falls, New York. Depreciation and Amortization Expense. Depreciation and amortization expense increased 146% to $13.4 million, or 11% of total revenue, during the year ended December 31, 2008 from $5.5 million, or 7% of total revenue, during the year ended December 31, 2007. Amortization expense increased to $10.2 million during the year ended December 31, 2008 from $3.8 million in the prior year due to the increase in definite-lived intangible assets as a result of our mergers and acquisitions in 2007. Depreciation expense increased to $3.2 million during the year ended December 31, 2008 from $1.7 million in the prior year due to the increase in fixed assets purchased and acquired as a result of our acquisitions. Goodwill and Asset Impairment. On December 31, 2008, the Company completed its annual impairment test of goodwill and other indefinite lived intangible assets and determined there was an impairment. The Company recorded a goodwill and intangible asset impairment charge of $102.6 million. 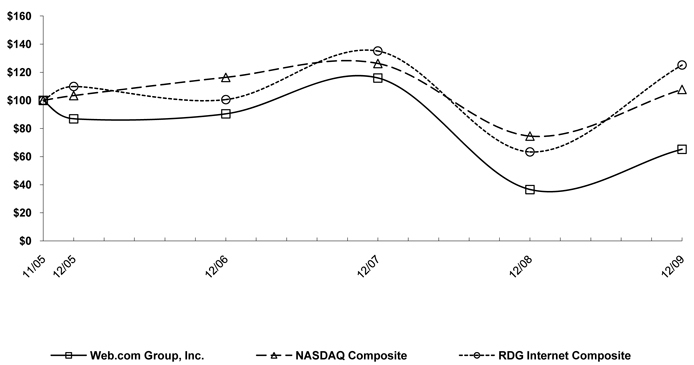 The primary reason for the impairment charge was the decline of our stock price during the fourth quarter of 2008. During the year ended December 31, 2007, based on our annual impairment test of goodwill and other indefinite lived intangible assets, there were no indicators of impairment. Net Interest Income. Net interest income decreased 58% to $822 thousand, or 1% of total revenue, during the year ended December 31, 2008 from $1.9 million, or 2% of total revenue, during the year ended December 31, 2007. The decrease in interest income was due to the reduced average cash balances available to invest in money market funds as a result of our recent acquisitions and the decline in interest rates. Income tax (expense). Income tax expense decreased to $125 thousand during the year ended December 31, 2008 from $2.1 million during the year ended December 31, 2007. The Company’s tax rate for the years ended December 31, 2008 and 2007 were 0.1% and 60.2%, respectively. The decrease in tax expense and tax rate was due to the permanent book to tax differences related to the goodwill impairment and stock based compensation. Discontinued Operations. On May 26, 2009, the Company sold its Net Objects Fusion software business. For the year ended December 31, 2008 and 2007, the revenue generated by the Net Objects Fusion software business was $2.5 million and $2.4 million and net income (loss) was $170 thousand and ($121) thousand, respectively. As of December 31, 2009, we had $39.4 million of unrestricted cash and cash equivalents and $32.2 million in working capital, as compared to $34.1 million of cash and cash equivalents and $24.0 million in working capital as of December 31, 2008. Net cash provided by operations for the year ended December 31, 2009 increased 3%, or $480 thousand, to $15.5 million from $15.0 million for the year ended December 31, 2008. Net cash used in investing activities in the year ended December 31, 2009 was $5.2 million as compared to $3.7 million in the year ended December 31, 2008. During the year ended December 31, 2009, we acquired substantially all the assets and select liabilities of Solid Cactus for approximately $3.5 million. Additionally, we sold our NetObjects Fusion software business and recorded net proceeds of $808 thousand in connection with the initial payment. We also invested approximately $1.1 million in property and equipment and intangible assets. We increased restricted cash by $1.2 million due to provisions in our Jacksonville building lease agreement. During the year ended December 31, 2008, we acquired certain assets of LogoYes.com and Design Logic, Inc. totaling approximately $4.3 million, including acquisition expenses. We also acquired approximately 9,300 customers at a cost of $1.4 million, which included $364 thousand liability for service to be provided to the acquired customers. We received proceeds from the sales of restricted investments totaling $8.5 million and reinvested $3.5 million of those proceeds. The uninvested proceeds were transferred to a money market account and classified as unrestricted cash. We purchased $4.3 million of real property and equipment and paid off a note payable and the related restricted cash was released and classified as unrestricted cash. Net cash used in financing activities in the year ended December 31, 2009 was $4.9 million as compared to net cash used in financing activities of $6.9 million for the year ended December 31, 2008. On September 4, 2008, the Company announced that its Board of Directors authorized the repurchase of up to $20 million of the Company’s outstanding common shares over eighteen months from the approval date. On March 3, 2010, the Board of Directors extended the repurchase program for an additional twelve months. During the year ended December 31, 2009, we repurchased approximately 1.5 million shares of our common stock and options to purchase 225,000 shares of our common stock for approximately $5.7 million and paid $641 thousand for debt obligations we assumed as part of the Solid Cactus acquisition. In addition, we received proceeds from the exercise of stock options totaling $1.4 million. During the year ended December 31, 2008, we had repurchased 2.1 million shares for $6.9 million. We reissued 608 thousand of those shares for exercises of stock options, warrants and restricted share issuances receiving proceeds of $1.2 million. In addition, we reduced our debt obligations by $1.2 million. Non-GAAP Operating Income. We exclude from non-GAAP operating income amortization of intangibles, fair value adjustment to deferred revenue, restructuring charges and stock-based compensation charges. We believe that excluding these non-cash charges assist management and investors in evaluating period-over-period changes in our operating income without the impact of items that are not a result of our day-to-day business and operations. Non-GAAP Net Income and Non-GAAP Net Income per Diluted Share. We exclude from non-GAAP net income and non-GAAP net income per diluted share amortization of intangibles, income tax expense, fair value adjustment to deferred revenue, restructuring charges and stock-based compensation, and include cash income tax expense, because we believe that excluding such measures helps management and investors better understand our operating activities. Adjusted EBITDA. We exclude from Adjusted EBITDA depreciation expense, amortization of intangibles, income tax, interest expense, interest income, stock-based compensation, and restructuring charges, because we believe that excluding such items helps management and investors better understand operating activities. Operating lease obligations are shown net of sublease rentals for the amounts related to each period presented. Includes interest expected to be paid. As of December 31, 2009 and 2008, we did not have any relationships with unconsolidated entities or financial partnerships, such as entities often referred to as structured finance or special purpose entities, which would have been established for the purpose of facilitating off-balance sheet arrangements or other contractually narrow or limited purposes. the extent to which we acquire or invest in other technologies and businesses. We believe that our existing cash and cash equivalents will be sufficient to meet our projected operating requirements for at least the next 12 months, including our sales and marketing expenses, research and development expenses, capital expenditures, and any acquisitions or investments in complementary businesses, services, products or technologies. Our results of operations and cash flows are subject to fluctuations due to changes in foreign currency exchange rates, particularly changes in the Canadian Dollar. We will analyze our exposure to currency fluctuations and may engage in financial hedging techniques in the future to reduce the effect of these potential fluctuations. We have not entered into any hedging contracts since exchange rate fluctuations have had little impact on our operating results and cash flows. The majority of our subscription agreements are denominated in U.S. dollars. We had unrestricted cash and cash equivalents totaling $39.4 million and $34.1 million at December 31, 2009 and 2008, respectively. These amounts were invested primarily in money market funds. The unrestricted cash, cash equivalents and short-term marketable securities are held for working capital purposes. We do not enter into investments for trading or speculative purposes. Due to the short-term nature of these investments, we believe that we do not have any material exposure to changes in the fair value of our investment portfolio as a result of changes in interest rates. Declines in interest rates, however, will reduce future investment income. The following tables set forth selected unaudited quarterly consolidated statement of operations data for the eight most recent quarters. The information for each of these quarters has been prepared on the same basis as the audited consolidated financial statements included in this prospectus and, in the opinion of management, includes all adjustments necessary for the fair presentation of the results of operations for such periods. This data should be read in conjunction with the audited consolidated financial statements and the related notes included in this annual report. These quarterly operating results are not necessarily indicative of our operating results for any future period. Includes a goodwill and intangible asset impairment charge of $102.6 million. Operating results relating to NetObjects Fusion revenue and expenses for all periods presented were reclassed to income (loss) from discontinued operations. Included in income (loss) for the year ended December 31, 2009 is a tax benefit of $1.4 million, which was the result of a reduction in the deferred tax asset reserve allowance. Based on their evaluation as of December 31, 2009, our Chief Executive Officer and Chief Financial Officer, have concluded that our disclosure controls and procedures (as defined in Rules 13a-15(e) and 15d-15(e) under the Securities Exchange Act of 1934, as amended) were effective at the reasonable assurance level to ensure that the information required to be disclosed by us in this annual report on Form 10-K was recorded, processed, summarized and reported within the time periods specified in the Securities and Exchange Commission’s rules, and that such information is accumulated and communicated to us to allow timely decisions regarding required disclosures. Our disclosure controls and procedures are designed to provide reasonable assurance of achieving their objectives. Our management, including our Chief Executive Officer and Chief Financial Officer, does not expect that our disclosure controls and procedures or our internal controls will prevent all errors and all fraud. A control systm, no matter how well conceived and operated, can provide only reasonable, not absolute, assurance that the objectives of the control system are met. Further, the design of a control system must reflect the fact that there are resource constraints, and the benefits of controls must be considered relative to their costs. Because of the inherent limitations in all control systems, no evaluation of controls can provide absolute assurance that all control issues and instances of fraud, if any, within our Company have been detected. The management of Web.com Group, Inc. is responsible for establishing and maintaining adequate internal control over financial reporting as such term is defined in Rules 13a-15(f) and 15d-15(f) under the Securities Exchange Act of 1934, as amended. The Company’s internal control over financial reporting is designed to provide reasonable assurance, based on an appropriate cost-benefit analysis, regarding the reliability of our financial reporting and the preparation of financial statements for external purposes in accordance with U.S. generally accepted accounting principles. The Company’s internal control over financial reporting includes those policies and procedures that: (i) pertain to the maintenance of records that, in reasonable detail, accurately and fairly reflect the transactions and dispositions of the assets of the Company; (ii) provide reasonable assurance that transactions are recorded as necessary to permit preparation of financial statements in accordance with U.S. generally accepted accounting principles, and that receipts and expenditures of the Company are being made only in accordance with authorizations of management and directors of the Company; and (iii) provide reasonable assurance regarding prevention or timely detection of unauthorized acquisition, use or disposition of the Company’s assets that could have a material effect on the financial statements. Because of its inherent limitations, internal control over financial reporting may not prevent or detect misstatements. Therefore, even those systems determined to be effective can provide only reasonable assurance with respect to financial statement preparation and presentation. Also, projections of any evaluation of effectiveness to future periods are subject to risk that controls may become inadequate because of changes in conditions, or that the degree of compliance with the policies or procedures may deteriorate. Management assessed the effectiveness of the Company’s internal control over financial reporting as of December 31, 2009. In making this assessment, management used the criteria set forth by the Committee of Sponsoring Organizations of the Treadway Commission (COSO) in Internal Control-Integrated Framework. Based on management’s assessment and those criteria, management concluded that the Company maintained effective internal control over financial reporting as of December 31, 2009. The Company’s independent registered public accounting firm, Ernst & Young LLP, has issued an audit report on the effectiveness of the Company’s internal control over financial reporting. The Board of Directors and Shareholders of Web.com Group, Inc.
We have audited Web.com Group Inc.’s internal control over financial reporting as of December 31, 2009, based on criteria established in Internal Control—Integrated Framework issued by the Committee of Sponsoring Organizations of the Treadway Commission (the COSO criteria). Web.com Group, Inc.’s management is responsible for maintaining effective internal control over financial reporting, and for its assessment of the effectiveness of internal control over financial reporting included in the accompanying Management’s Report on Internal Control over Financial Reporting. Our responsibility is to express an opinion on the company’s internal control over financial reporting based on our audit. In our opinion, Web.com Group, Inc. maintained, in all material respects, effective internal control over financial reporting as of December 31, 2009, based on the COSO criteria. We also have audited, in accordance with the standards of the Public Company Accounting Oversight Board (United States), the 2009 consolidated financial statements of Web.com Group, Inc. and our report dated March 5, 2010 expressed an unqualified opinion thereon. There were no changes in our internal controls over financial reporting (as defined in Rules 13a-15(f) and 15d-15(f)) during the quarter ended December 31, 2009 that have materially affected, or are reasonably likely to materially affect, our internal controls over financial reporting. The information required by this item, including such information regarding our directors and executive officers and compliance with Section 16(a) of the Securities Exchange act of 1934, is incorporated herein by reference from the Proxy Statement. We have adopted a written code of ethics that applies to our principal executive officer, principal financial officer and principal accounting officer, or persons performing similar functions. The code of ethics is posted on our website at http://ir.websitepros.com/sec.cfm. Amendments to, and waivers from, the code of ethics that applies to any of these officers, or persons performing similar functions, and that relates to any element of the code of ethics definition enumerated in Item 406(b) of Regulation S-K, will be disclosed at the website address provided above and, to the extent required by applicable regulations, on a current report on Form 8-K. The information required by this item is incorporated herein by reference from the section entitled “Executive Compensation” in the Proxy Statement. The information required by this item is incorporated herein by reference from the sections entitled “Security Ownership of Certain Beneficial Owners and Management” and “Equity Compensation Plan Information” in the Proxy Statement. The information required by this item is incorporated herein by reference from the section entitled “Certain Relationships and Related Transactions” in the Proxy Statement. The information required by this item is incorporated herein by reference from the section entitled “Ratification of Selection of Independent Registered Public Accounting Firm” in the Proxy Statement. We have audited the accompanying consolidated balance sheets of Web.com Group, Inc. as of December 31, 2009 and 2008, and the related consolidated statements of operations, stockholders’ equity (deficit), and cash flows for each of the three years in the period ended December 31, 2009. These financial statements are the responsibility of the Company’s management. Our responsibility is to express an opinion on these financial statements based on our audits. We conducted our audits in accordance with the standards of the Public Company Accounting Oversight Board (United States). Those standards require that we plan and perform the audit to obtain reasonable assurance about whether the financial statements are free of material misstatement. An audit includes examining, on a test basis, evidence supporting the amounts and disclosures in the financial statements. An audit also includes assessing the accounting principles used and significant estimates made by management, and evaluating the overall financial statement presentation. We believe that our audits provide a reasonable basis for our opinion. In our opinion, the consolidated financial statements referred to above present fairly, in all material respects, the consolidated financial position of Web.com Group, Inc. at December 31, 2009 and 2008 and the consolidated results of its operations and its cash flows for each of the three years in the period ended December 31, 2009, in conformity with U.S. generally accepted accounting principles. We have also audited, in accordance with the Standards of the Public Company Accounting Oversight Board (United States), Web.com Group, Inc.’s internal control over financial reporting as of December 31, 2009, based on criteria established in Internal Control—Integrated Framework issued by the Committee of Sponsoring Organizations of the Treadway Commission and our report dated March 5, 2010 expressed an unqualified opinion thereon.